This week the previously announced Iron Skyreaver mount found its way to the in game store… and I simply could not resist picking it up. The mount is amazing, but it seems that it seems to be one of those love or hate situations among my close friends. Some of them absolutely love it, some of them completely hate it. The pure win of the mount is the fact that every so often it does a roll… I have been informed by one of my pilot friends that it is NOT a barrel roll. Quite frankly it doesn’t matter because every time it happens… I hear Peppy say “Do A Barrel Roll!”. Thanks Star Fox for misappropriating that term! In truth in game it is a bit smaller than I had originally expected, or at the very least it doesn’t scale as much as I would expect it would for a Worgen. Some of my friends have called it sickly looking, but really if you think about the background of the mount it makes sense. This is a chimera that the Iron Horde has captured into slavery… likely abused and mistreated… and then augmented with badass armor and JET THRUSTERS!!!! You have apparently rescued it from Garrosh and his evil evil machinations. Now you and your mechano-chimera can rule the skies together! Another project I have been working on is chewing through the crafting cooldowns to make my own Sky Golem mount. Unlike most engineering mounts in the past, this one is actually usable by all of your characters. Which has made it a high priority for me to obtain. At some point I need to go back and build some of the other engineering mounts, as I never actually obtained my Mekgineer’s Chopper. Since I stopped playing Belghast as my main somewhere during Crusader’s Coliseum it just stopped being priority for me to get one. Additionally I got the recruit a friend two person rocket, which filled the need of being able to transport people with me. If they made it so all characters on your account could use the chopper… I would prioritize making one. The big slowdown for the Sky Golem is the engineering cooldown, which at face value is really easy to craft. Jard’s Peculiar Energy Source takes only ten ghost iron bars, which is next to nothing… however it is on a daily timer and unlike all of the other cool downs out there… it is lacking a “speed up for more materials” option. The sky golem requires 30 of these, and 30 living steel. The living steel component however is not terribly bad since if you have a transmute spec alchemist you can get extra bars from time to time. At this point I am 6 days including today away from my sky golem mount, so I will keep you guys informed as I finally craft it. One of the last things I want to give an update on is my quest for exalted with the Netherwing. Essentially this has been one of those semi-casual things that I do every night. I go out to Shadowmoon Valley, complete all the quests… gather up all of the loose eggs that I happen to see while doing those quests and then move on for the night. I am sure if I wanted to seriously grind this out, I could do so in a single afternoon doing nothing but collecting eggs. However at this point I am at about the halfway point through Revered. At this point I figure I have a few more days until I have crossed the exalted threshold. I am bad at estimating these things, but given I tend to find a half dozen eggs each day I think this might be viable. Mostly I have been doing this because I want the count of six more mounts. 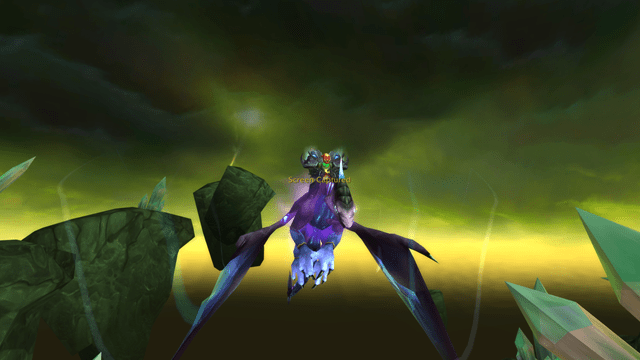 I have never particularly liked the look of the netherwing. I love the fact that they have a whole series of colors available, but it is the whole shark nosed dragon thing that gets to me. I have actually enjoyed the grind because I miss Draenor. I am looking forward to Warlords in part because I am really wanting to see Draenor as a viable place again. Burning Crusade was the expansion that I really came alive in, and grew into the role of raid tank and large-scale guild leader. While Wrath of the Lich King was the expansion we saw the most success during, I feel like Burning Crusade is my “golden age” of WoW gaming. I just want to meet the announcer guy in that Iron Skyreaver commercial you linked.